I everyone! This week is already winding up to be a busy one for me, I am desperate for finding a way to fit more hours in the day. Or needing less sleep, whichever is easier to do. So, instead of my typical DIY or home decor post I am sharing the Behind the scenes happenings around here. Next week I have a big announcement happening! 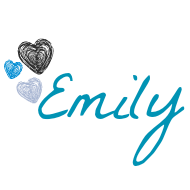 Massive changes and exciting developments for this little blog of mine. The announcement and changes will be revealed on Wednesday! I will give one hint, I am not pregnant and we are not moving out of our home. I feel like as a blogger any teasing of news is met with expectations of baby bumps and cute squishy baby pictures. 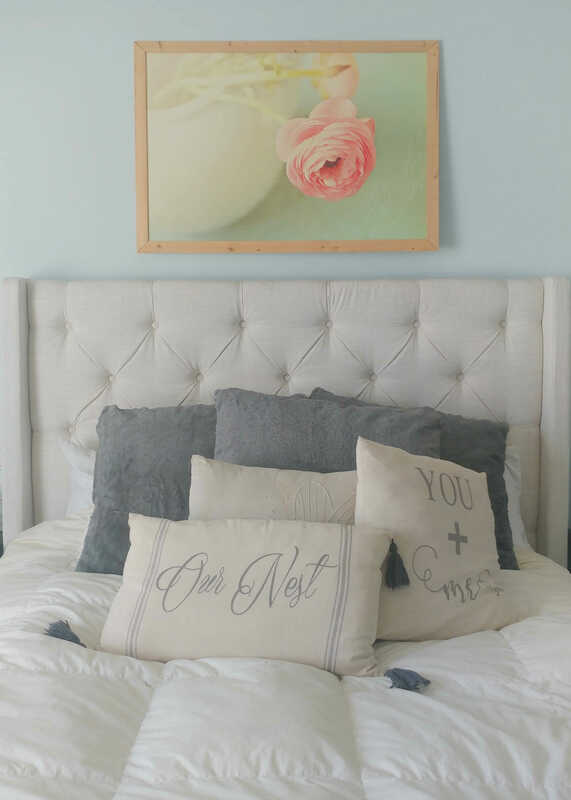 A home decor blog announcement almost always is a planned move. We are staying put, and no new additions are being added to our family. I am however very excited for the newest development and have been beyond antsy to share it with you all! As you can imagine, there has been a lot of behind the scenes planning, scheming, and organizing. Which has limited my DIY and home decorating time, not completely though. Tomorrow I will be revealing a new work space for me, which I am in lurve with! I also have on my to-do list plans to take and edit pictures of my hallway bathroom and master bedroom. My bedroom went through a few minor changes, just some new furniture items and rearrangement. Nothing fancy, but I like to share my home (kind of the point of this blog) so I have been planning to share it here. This week I am also in Birthday mode, my oldest is turning 10 tomorrow! I am fine, really….. not really, not at all… not even a little bit! Guys, where does the time go?!!!! We had a sleepover last weekend with a gaggle of girls. Fun fact, squeals and giggles can be very loud. This coming weekend we are hosting a family party for her. 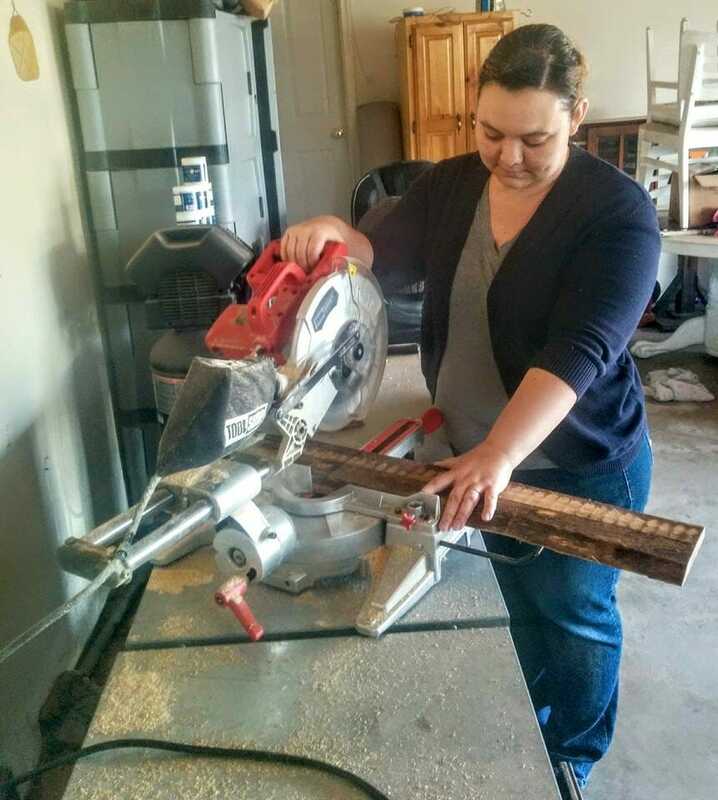 No matter what is going on with home decor projects or this blog I am always in Mom mode, just the truth. I am either running them to activities, getting them to school, volunteering at their school, meetings for their school PTO, homework, huge, cuddles, giggles, breaking up fights between my trio… it is always something. I am also revealing a updated hallway bathroom soon. The bathroom is a whole other saga that was forced upon me thanks to my wonderfully mischievous dogs Teddy and Finn. We had plans to be gone all day, and typically when we are gone Finn (who is 2 years old, but still very puppy-ish being a Lab) is in a dog crate when we are gone. He likes to chew and annihilate my throw pillows when left out of his crate. I should note that these bathroom pictures is what the bathroom was before, so this is not the after pictures. Since the plan was for us to be gone all day I did not want him cooped up in his crate, I put both dogs in the bathroom. 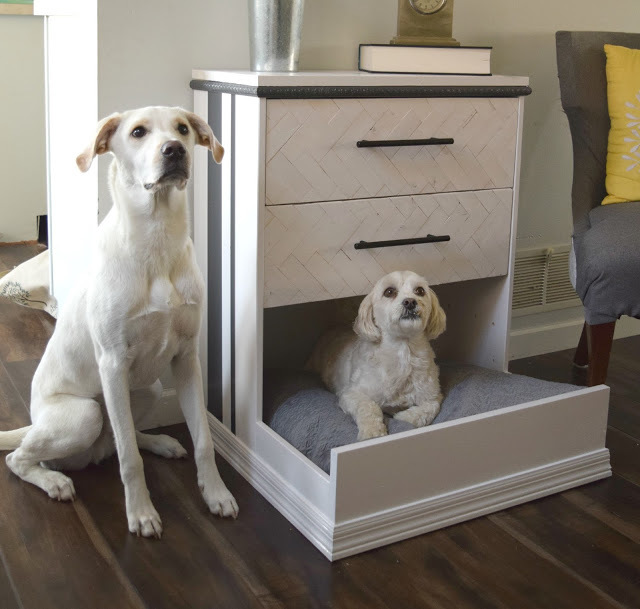 With their dog beds, chew toys and the light on. Let them roam without being stuck. We came home to a massive hole in the bathroom wall. They ate through the drywall! Had we been gone another hour we would have come home to see their faces sticking out the other side of the wall into the hallway. The above picture is the damage done by them. They were fine, and very excited to see us. Zero guilt from either of them, I guess we spoil our furry babies. So a minor bathroom update was forced upon us thanks to Teddy and Finn. I have always been “eh” about the yellow in the hallway bathroom. Once we realized that the walls would have to be painted I was all for it. I also did a few other minor updates, changing the theme of the decor and a few tiny changes. Nothing big here, the floors are the same and the shower is the same. We are still a couple years away from complete bathroom gut jobs around here. I will however be sharing the ever helpful tutorial on patching up drywall. Since this is something everyone will experience at some point. Maybe not the dog chewing through the wall, but a hole in the wall is likely to happen at some point. With the new work space that you can see tomorrow I also have two new DIY’s featured in the space. One furniture project and one that is for wall decor. I have been so hung up on the Behind the scenes happenings that decorating my home has been slowed down a little. However, the extra work I am putting in for this blog will be revealed next week and I am sooooooo excited! I look forward to seeing your new workspace! and your bathroom update. I always get great ideas from you. I’m in the middle of redoing my second guest room and it’s time to pick out paint. Thank you so much! Have fun redoing your bedroom! You’ve already done so much work in your house and I love how everything has come out so far. I can’t wait to see your workspace. Sure it feels wonderful to have completed so much work and now to be able to sit back and enjoy your home. You did a great job and admire you did so much yourself. We had a dog that somehow scratched his way through part of the wall once. He didn’t bat an eye when we foud it and scolded him. My husband has yet to finish fixing the spot completely. Oh those dogs are horrible and so cute too! OH my dog was the worst for home destruction! He chewed right on through our basement wall AND our bathroom wall. He was such a stinker but he eventually grew out of eating our walls and went on to eating our socks! What a silly boy! Happy birthday to your wee one who isn’t so wee anymore. I mean they will always be small in our hearts. Double digits is a big thing for kids. I remember that all too well! I’m super excited for you and all the changes going on! YAY! Oh wow, your dog can do some serious damage! It is hard to see our little ones grow up, I love getting to know more of their personalities as they get older but it all goes so fast! Your home is gorgeous! I love the decor and colors. My daughter is 10 as well. Time does fly by, that’s for sure. Thank you so much! Time does fly too fast! Oh my gosh, your dogs are the cutest! You can’t stay mad at those cute faces to long. Can’t wait to hear your news. It was tough to stay mad at them, and now that it is all repaired we just have a funny story to tell. I can’t wait to see what else you do. I don’t know what I would have done if my dogs chewed up my bathroom wall. They are cute though. It was tough to come home to, but luckily I knew how to repair it! Oh no, lol! We had something similar happen over the weekend. We left for the day, and our dog climbed over the baby gate, that keeps two of them in their area in our utility room. She tore the whole bottom of the door up. We came home to a huge mess. We will have to replace the door. Oh wow, I am sorry your dog did that! Wow, they really did a number on your bathroom wall. 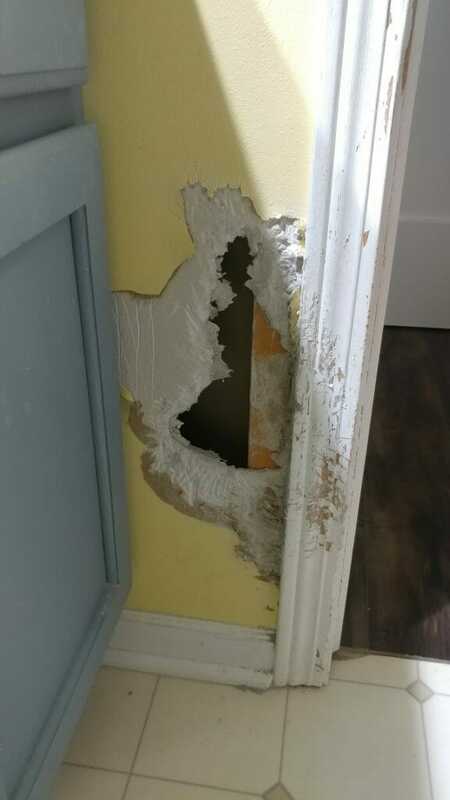 We locked our dog in the bathroom once and she almost clawed through the door trim. Live and learn. Yeah, I have learned my lesson too! Oh no! I can’t believe they did that much damage. Their cute faces must have made it a bit easier to deal with. Sorry you have a mess to clean up though!! It was tough to deal with but luckily it is all handled now! Oh no, I bet it was a surprise to come home and see that they had eaten through the dry wall. At least you get to replant now! 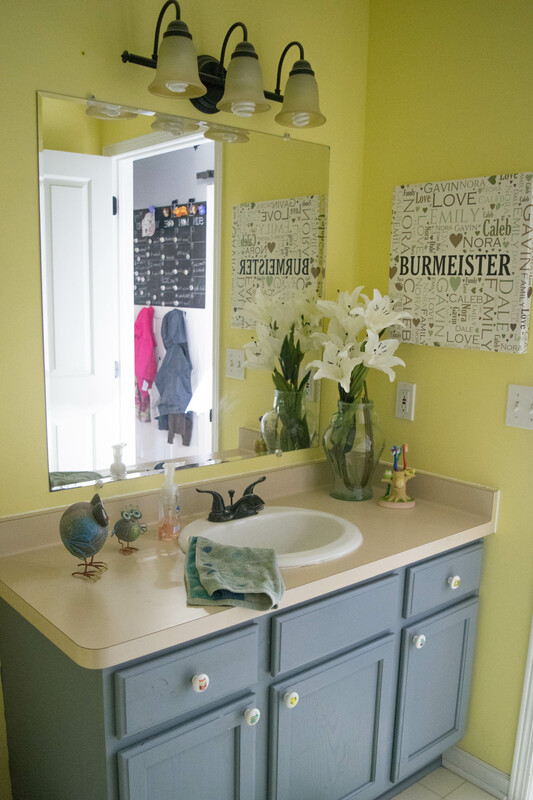 Yes, even though it is a forced remodel it has been fun to do a small mini makeover in the bathroom! Wow! I mean they really went to town on that wall! My friend always complains about her dog and the trash, but this is pretty extreme. At least it helped you jumpstart another renovation. I’m sure it will be beautiful just like the rest of your home. I love your house very organized and neat. I love getting ideas from others , I wish I am more handy person like you. You did a great job on your home. You did such a good job! I love what you did with the bathroom. I wish I had more time to do this. You did such a great job. OMG! i can’t believe your dogs did that! What a mess. My dog is not into chewing things, he never did and would also eat soft food. Anyway, I love your home. It is so cozy and shows so much love with all those photos and memorabilia. I am excited to see your new workspace too. Oh my. I can’t believe your dogs would do that to your wall. However, how could you stay angry at those cute (and guilty) faces! I wish I was as good with tools as you. Your home is lovely! Thank you so much! It was tough to stay mad at them and luckily I know how to fix the hole in the wall. 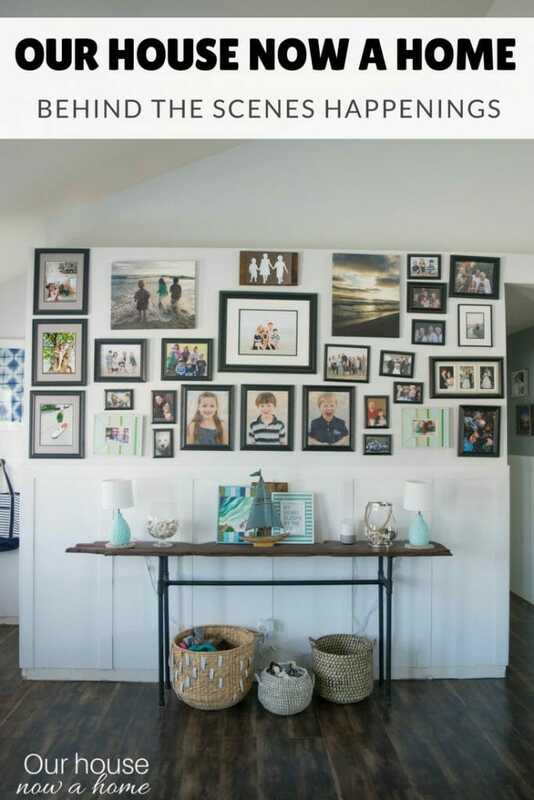 Love love love that picture wall. I have been meaning to do that! Now I will.